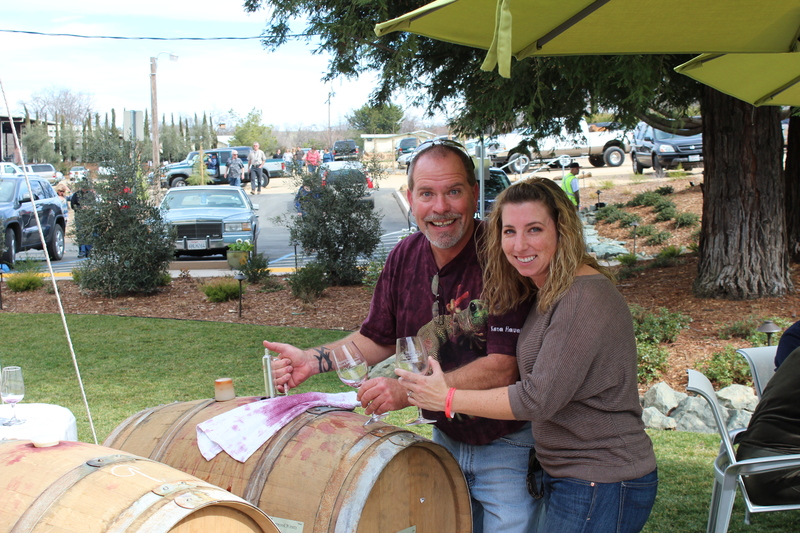 Each year the Amador Vintner’s Association puts on an event called “Behind The Cellar Door” – for $50, you get to visit as many of the thirty-six vineyards that are a part of the association. They all serve food as well as pour samples of their wines. I have never made it to the second day – one day is more than enough for me! When you arrive at the first vineyard, they give you a glass that you take with you to each one that you visit, along with a wristband that identifies you as part of the event. We all chip in to rent a van and hire a driver (Darryl, the awesome guy who drove the van at our wedding!) and that way we all have a safe, fun time. This year we had fourteen (!!!) 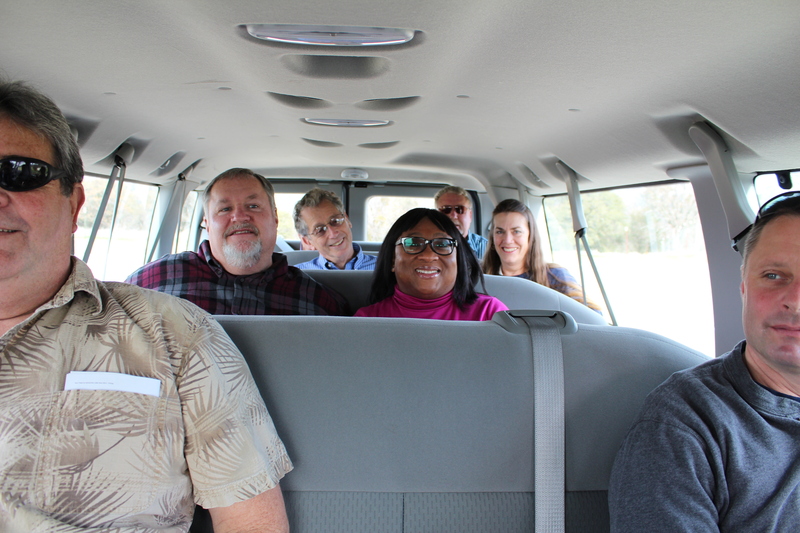 people – here’s a pic of the van before we picked up the last three. 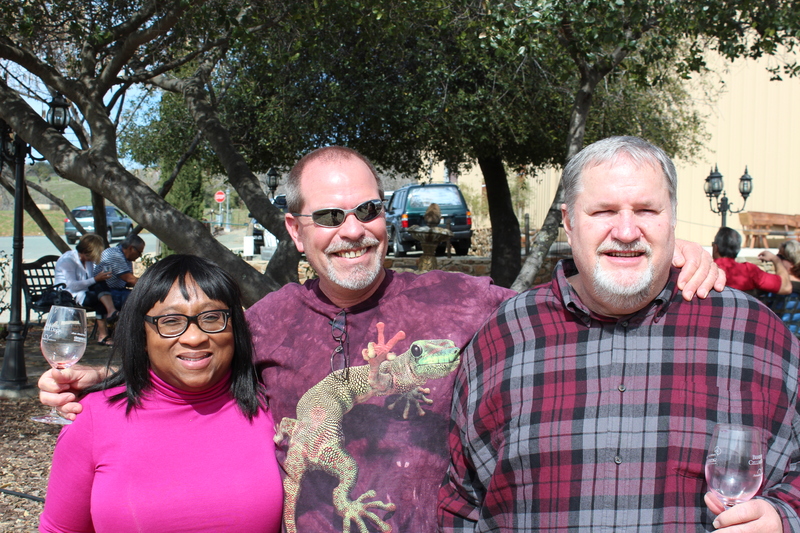 Our first stop was at Sierra Ridge Winery. This was one of the vineyards that I had never been to, even though I drive past it twice a day on the way to and from work. My favorite wine here was the Pinotage, a variety of grape brought here from South Africa. According to their website, they’re the largest producer of Pinotage in the United States! The food here was pretty delicious as well – right when we entered the tasting room they had all sorts of jams and crackers. Mike and I absolutely loved the cherry chutney and the cherry chili – we bought a jar of each and are going to try to reproduce them! Then, back where the barrel tasting was, they had salad, bread, and Vinciguerra Ravioli Company ravioli. These are absolutely amazing! Stop number two was at Drytown Cellars. My favorite wine at this stop was the 2010 Shenandoah Valley Zinfandel – it had a great peppery taste with some zing to it! 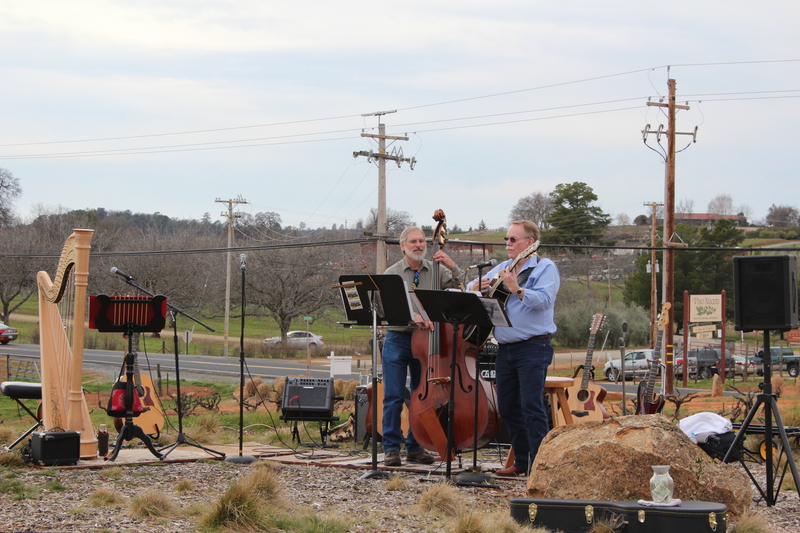 They had absolutely amazing meatballs here – they were made by the Sutter Creek Cattle Company. While we were there, they gave a great little overview on the difference between store-bought beef and grass-fed beef. The difference was amazing – Mike and I are going to order some from them (40 pounds!) and see how we like it! 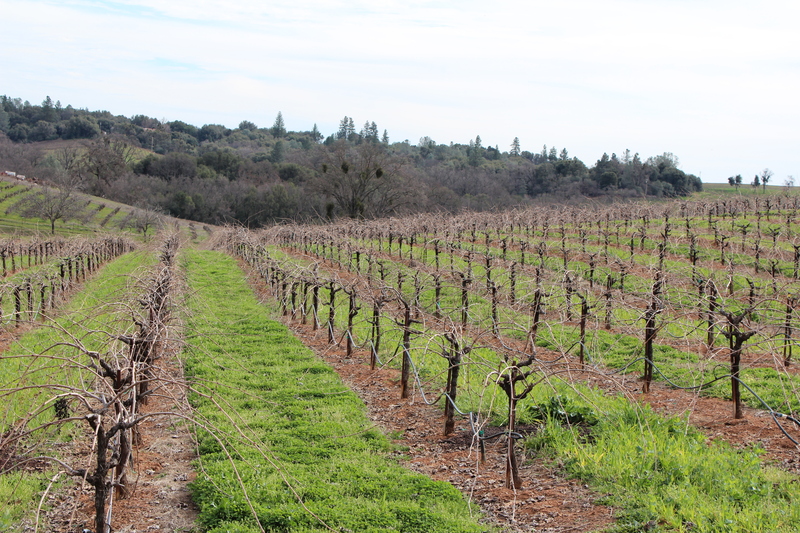 Our third stop was at Convergence Vineyards – named for the three creeks that come together on the property (Amador, Rancheria, and Dry Creeks). This was one of my favorite stops – I fell in love with the 2008 Carignane. They also had a great Zinfandel chocolate raspberry sauce that I buy every year – it tastes so good on ice cream! This vineyard has an Irish theme to it – they served a fantastic potato soup! Stop number four was Borjon Winery at my least favorite vineyard (it was earlier this year, so I was actually able to figure out why – normally this one is later in the lineup and my “palate” is not quite so great). Their wines are very strong and have a strong black licorice influence – something that is on my list of tastes I dislike. They did have some great spicy bean soup and a Santana cover band that was really good! Mike and I sat on this little park bench in the shade (it was pretty warm yesterday) and just listened to the band for a while… it was so nice! Our fifth stop was at Renwood Winery. To be honest, the whole reason we decided to try this one was that they said they had gourmet hamburgers and at this point in the day, that sounded fantastic. As it turned out, gourmet meant beef and lamb, which is not right up my alley. Just when I was about to be really disappointed, I discovered the macaroni and cheese. Definitely up my alley. I was even more excited to be walking back to the table only to find that they were serving fried macaroni and cheese balls. It was a little taste of heaven! After a little bit of eating, we headed into their super cool tasting room – the lady took the time to walk Mike & I through all six different wines! We then went back outside to have some apple cupcakes and try their Amador Ice – a light dessert wine that is surprisingly yummy (not nearly as sweet as some of them come). Troy & I Enjoying Some Barrel Wine! Stop number six was Dobra Zemlja Winery, a Croatian vineyard. This one actually hosts the event in their wine cave – it was fun to hang out there a little bit! I really liked their late harvest Zinfandel (paired with a brownie for me and a Croatian cheeseburger for Mike). 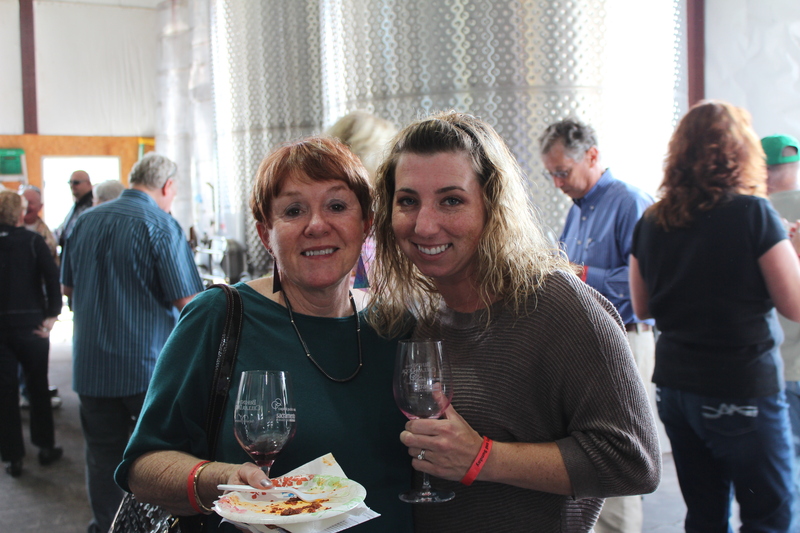 He really liked the Milan Ruz – a blend of their Sangiovese, Syrah, and Zinfandel wines. 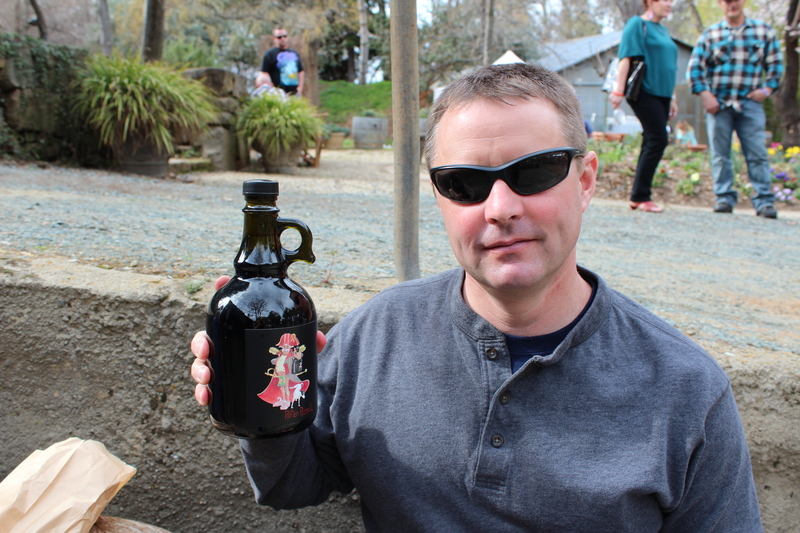 In fact, we bought a jug. 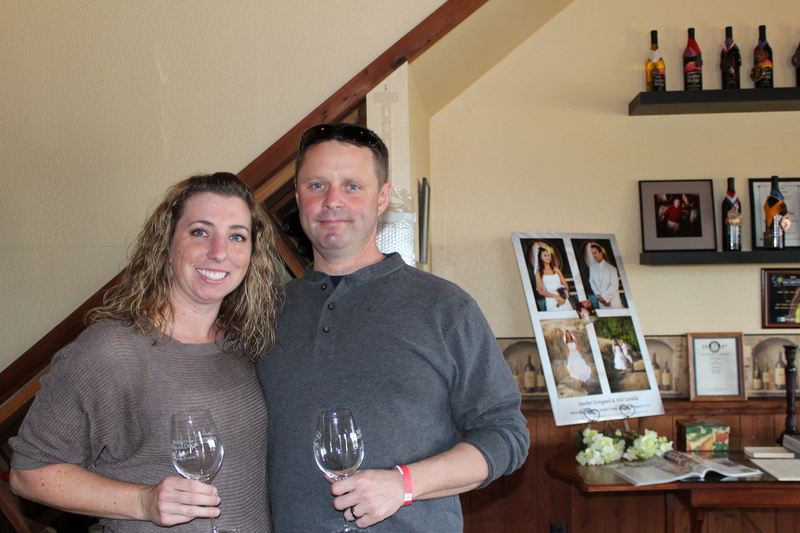 Our seventh stop was at BellaGrace Vineyards. They had a French theme going, complete with accordion player! They served French onion soup along with their wines. 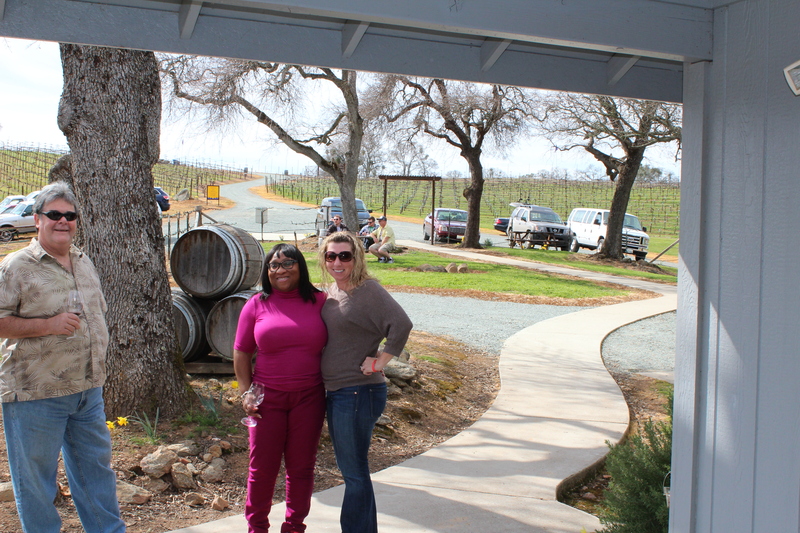 I really liked their Duex Femmes wine and the stunning view! Our eighth stop was Andis Winery. It was here that I found the one Grenache that I actually liked as well as a white that I liked (I don’t typically like white wine at all!). They were serving shrimp (yuck) and curried rice (YUM!) and had a great little band. Our final stop (and vineyard number NINE!) was Bray Vineyards. 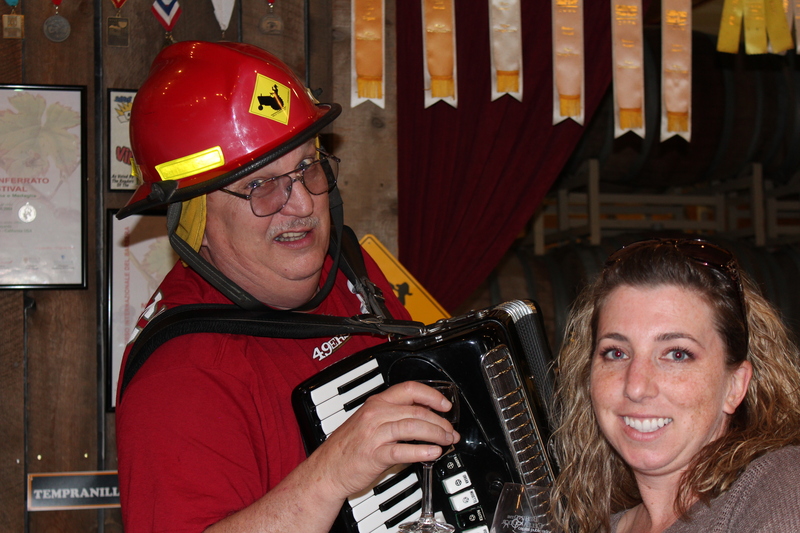 This place was a lot of fun – they had this random accordion player wandering around and had good wines with fun names (like the 2010 Brayzin Hussy Red). This event was seriously a great time! I can’t wait to go again next year! We’re even talking about going to the “Big Crush” in the fall this year!